A really clean home theater means hiding the equipment. Unfortunately, hiding the equipment sometimes means problems with the remote. Most remote controls work with infrared signals that can’t see through wood or metal. The problem gets worse if you have a media closet far away from the room where you want to watch TV. The answer is to use an RF remote control, but in the past the only options were pricey models like the Harmony 900 ($349 MSRP, street price around $250). DIRECTV satellite receivers will use their proprietary RF technology, but that doesn’t do a whole lot if you’re trying to control any other piece of equipment, like a TV or audio receiver. In the past, there have been RF kits for existing remotes, but they have usually been big heavy lumps that sit on the front of the remote, throwing the weight off. Enter the NextGen Invisible Multi-Room Remote Extender. OK, so the name isn’t so catchy. But this product is supposed to do everything that a high-end remote does and it’s only a penny shy of $50. Slightly more expensive models control four, five, or seven devices. The one-device version was supplied for review. 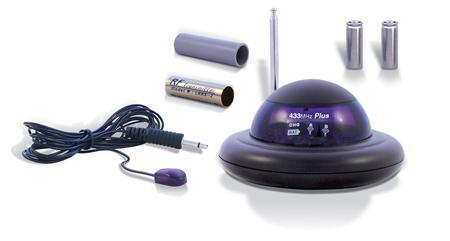 The remote extender comes with the base unit, IR blaster, power cable, two batteries, the RF transmitter and a plastic AA sleeve. The batteries are rechargeable, which is great because they don’t look like the sort you get at the drugstore. In fact, they look a little bit like rifle shells. Here’s how it is supposed to work: The batteries fit into a little sleeve that is the exact same size as a AAA battery. It replaces one of the batteries in your remote. What if you need AA batteries instead? A plastic sleeve is included that makes the entire package the same size as a AA battery. Here’s the magic part: When you put the entire module in your remote, it’s close enough to your remote’s IR transmitter that it can listen for the transmissions even though it’s behind the transmitter. It translates those codes to RF, and broadcasts them. RF broadcasts have no problem going through plastic or metal, so being in the battery compartment doesn’t stop things at all. The RF receiver doubles as a battery charger for the little batteries, and can charge both at the same time. One of the batteries charges while in its RF transmitter/AAA-battery sleeve so it’s easier to keep everything together. When the whole system is set up, the remote receiver sits on or near whatever you want to control. A wire runs from the receiver to the front of the equipment you want to control, with the little bulb sitting in front of its infrared eye. This is the same sort of IR blaster setup that is used on other devices like the Slingbox and it uses a 3.5mm TRS connector (looks just like a headphone plug) just like other IR control devices you might have seen. After that… it’s supposed to “just work.” The only hitch is that the manufacturer’s instructions say to charge the supplied batteries for 24-36 hours before you try them. Tomorrow, the Remote Extender gets put through its paces with a full battery charge.